This project, having premiered at Sommerszene Festival 2018, will see its revival performance at ART SPACE stift millstatt on the 8th of February, 2019, 20:00 hrs. This project is produced by INFLUX - Netzwerk für Tanz, Theater und Performance, and co-produced by Szene Salzburg and büro für tanz | theater | produktionen, Millstatt. It is funded by ​Stadt Salzburg Kultur, Bildung und Wissen, Salzburg Land Kulturabteilung, Land Kärnten and supported by ARTSPACE stift millstatt and Toihaus Theater, Salzburg. The production is supported with scientific inputs from Eva-Maria Kubin/DSP Cultural Production Dynamics, Universität Salzburg. As usual, the new year starts with a clown workshop at GEA from the 11th - 13th of January with Moving Clowns: Freiheit & Fiasko module. The second module, "Moving Clowns: Flow & Folie", will take place with a special focus on Valentine's Day, from 14th - 17th of February. Register now! Nayana has been invited to perform at the 30th anniversary celebrations of Afro-Asiatisches Institut on the 25th of October, 2018 in Kollegienkirche at 19:00 hrs. It is free entry to one and all. ​Nayana will be performing this work, choreographed by Tomaz Simatovic, as a part of Tanz_House Festival 2018 on the 24th of October at 20:00 hrs in ARGE Foyer. Nayana's first group choroegraphic production, "Room of Inevitable End", will be premiering at the Sommerszene festival, 2018, in ARGEkultur on 7th of June at 18:00 hrs. This will be followed with a second performance on the 8th of June at 20:00 hrs. Nayana has resumed teaching Bharatanatyam classes at the Afro-Asiatiches Institut starting March 12th. the classes will take place every Monday between 18:00 and 19:30 hrs, and is open to one and all. A residency has been offered at the Toihaus Theater for Nayana's on-going choreographic project "Room of Inevitable End". During the period from the 1 - 14 of February, Nayana will be working on the second phase of creation together with dancers Anna Bárbara Bonatto, Maayan Reiter, María Casares González, Maria-Pilmaiquén Jenny, Roni Sagi, and costume-designer Christina Pointner. The new year starts with a 3- day workshop in GEA Akademie, Schrems, from the 5 - 7 of January. A 4-day workshop "Moving Clowns: Flow und Folie" will take place from 3 - 6 of May. A second 4-day workshop "Moving Clowns: Freiheit und Fiasko" will take place towards the end of summer, from the 27 - 30 of August. Registrations and more information are available on the GEA website. Nayana will be teaching creative movement and Indian dance workshops at the 1. Österreichische Kinderyoga Festival to be held in Neumarkt am Wallersee, Austria, on the 30th of September and 1st of October 2017. The workshops are meant for children between the age groups of 5 - 10 years old. Nayana has been invited for a two-week choreographic residency by think tank + management: büro für tanz I theater I produktionen, curated by Andrea K Schlehwein, to work on her new production "Room of Inevitable Ends", from 14th - 27th August, 2017. This project will feature five performers, namely, Anna Bárbara Bonatto, Maayan Reiter, María Casares González, Maria-Pilmaiquén Jenny, Roni Sagi, with Christina Pointner for stage and costume design. This production is to premiere on the 7th of June, 2018 at Sommerszene Festival in ARGEkultur. As a part of the residency, Nayana together with Maayan Reiter and Anna Bárbara Bonatto, will be offering open classes for professional dancers called "On the Move" on the 16th, 17th and 18th of August from 10:00 - 12:00. Nayana will be presenting a Bharatanatyam evening with Katharina Fuchs and Asmita Banerjee on the occasion of Lange Nacht der Kirchen Festival 2017 at the Kajetaner Kirche on June 9th. The performance will be repeated twice. ​"Moving Clowns - Freiheit und Fiasko" will be held at the GEA Akademie, Schrems, Austria for the third consecutive year, from April 28 - 30th. A more elaborate follow-up of this workshop, under the title "Moving Clowns - Flow und Folie" will be held between July 10 - 13, 2017. "A Duet. Ein Solo. ", co-produced by ARGEkultur, has been invited to perform at the Salzburger Performance Tage Festival, curated by Helene Weinzierl/Tanzimpulse Salzburg, on the 10th of April 2017. Nayana was invited to be an artiste in residence at Dance Identity Burgenland, Centre for dance and choreography between 12 - 21 December 2016. 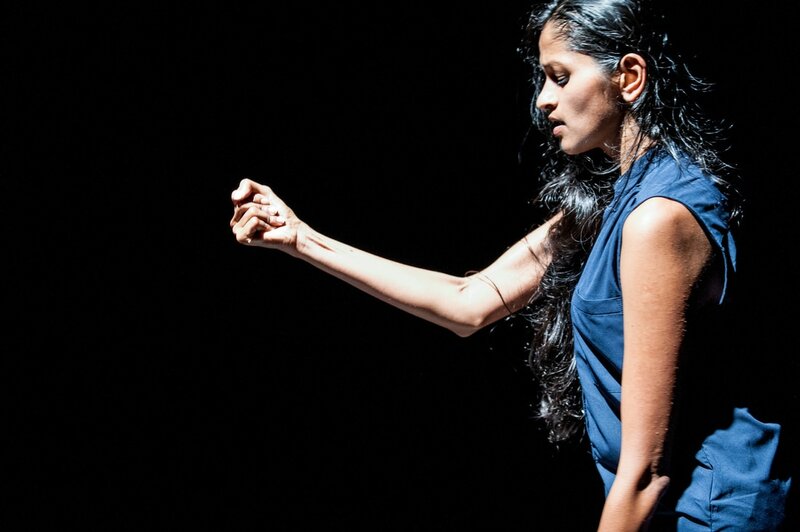 During this residency, Nayana continued to develop her choreographic work "A Duet. Ein Solo. ", while also offering a movement class as a guest teacher. Nayana is currently a resident artiste at Szene Salzburg studio between 01.09 - 18.09. and again from 03.10 - 13.10., wherein she will research on her next untitled collaborative dance project with Swedish choreographer Micke Strid, Austrian circus artiste Andrea Schalk, and German theatre actress Julia Leckner. A beginners' level 1 & 2 class will commence this winter semester of 2016 on the 10th of October at Afro-Asiatisches Institut, Salzburg. The classes take place on Tuesdays from 19:30 until 21:00 in Kollegien Kirche, starting from 11.10.2016. Registrations are now open! "Moving Clowns - Flow and Folie" and "Moving Clowns - Freiheit und Fiasko" will be held at GEA Akademie, Schrems, Austria, for the upcoming winter semester. Watch out this space for the dates! A 3-day weekend workshop and project will take place between 19.11.-21.11. as a part of a week-long project at AAI. Nayana and Peter will work with a group of participants on exploring their inner clowns, and developing a keen sense of listening to oneself as a practice to keep up in a world that continues to place more and more importance on money. The workshop will culminate in a clown street performance on the 21st. Nayana has been invited by Weltladen, Laufen to present an evening of Bharatanatyam recital as a part of the celebration of their 30th anniversary. The recital will be held at Salzach Halle, Laufen on 10th of October, 2016, 7pm. "Moving Clowns" has been invited to offer a one-day weekend workshop for the Munich hub of MIT U.Lab program. After an introductory evening workshop for 18 participants on September 22, a longer workshop will be conducted on November 26, 2016, in Munich. U.Lab is an eight-week online course co-founded by MIT and Harvard that draws on an understanding of human factors as the basis for innovation. By following it you will learn the basics of Theory U, a framework that encourages transformational change on individual and collective levels, and leads to innovative working style. For information about U-Lab, you can go to ​http://munich.impacthub.net/event/ulab/.